I like to tell people I have the heart of a small boy. Then I say it’s in a jar on my desk. A favorite book of mine is The Real Mother Goose. I’m not the most enthusiastic proponent for motherhood as a ‘path’ for every woman, but I will say that a great thing about being a mother is getting to re read all the beloved books from your own childhood. 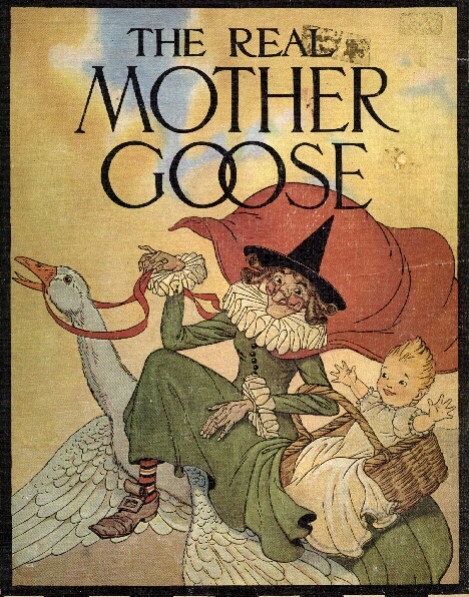 But I must have missed the fact that Mother Goose is rather dark when I was a child, which is something that amuses me now as I read these to my young son who is also entertained by them, though likely for different reasons. Take the “Three Blind Mice” for example: they run after the farmer’s wife who’s terrified and cuts off their tails in retaliation. And they’re blind mice. On the other hand, their mischievous chasing after the woman means they are not such “aw, shucks” pitiable little creatures–they undoubtedly know their effect on women who discover mice underfoot and start screaming in terror and are daring and provocative. Or “Georgie Porgy.” He’s a predator. He chases the little girls around kissing them and causing them to cry, then runs away like a coward when the boys come out to play. “Humpty Dumpty” falls off of a wall and despite the best efforts of the king’s men, is left in pieces. “Rock-a-bye Baby” is calmly lolled to sleep in a tree before dropping to the ground with the bough, cradle and all. Jack breaks his head open trying to get some water and is patched up with vinegar. Talk about infection. “Little Boy Blue” lazily sleeps through his chores. He’ll be fired (unless, of course, he lives in France). Meanwhile, Wee Willie Winkle is a total busybody. “Peter Peter Pumpkin Eater” keeps his poor wife captive – what a control freak – until he becomes less ignorant. But at least he changed. Wonder if it was therapy or a police threat? “The Old Woman Who Lives in a Shoe” regularly beats her children after giving them only broth for their dinner. “Bah Bah Black Sheep” has three bags of wool and makes a point of telling us he’s not giving a bag of it to the little boy who lives down the lane from him (ostensibly the little boy is a brat). How about the old man in “It’s Raining, It’s Pouring” who bumps his head and can’t get up in the morning? Jack Spratt’s wife only eats fat and while they lick the plate clean betwixt the two of them, his wife will die of cardiovascular disease. In “Ring Around the Rosie” everyone has a pocket full of posies then falls to the ground in ashes. “Goosey, Goosey, Gander” throws an old man down the stairs by his leg for not saying his prayers. “Lucy Locket” has no money in her purse, the loss of which she cries for. Little Polly Flinders gets whipped for messing up her new clothes when she’s trying to warm her toes at the fire. “Old Mother Hubbard’s” dog takes her for granted, even after she goes out searching for food for him. A beggar steals a moppet pet from a child. “Tom Tom, the Piper’s Son” steals a pig, eats it, and is beaten for it. The maid gets her nose taken off by a blackbird in “Sing a Song of Sixpence” while the king is counting his money and the queen is eating bread and honey (talk about social disparity). “The Kilkenny Cats” fight till there’s nothing left of either of them except their nails and the tips of their tails. Does London Bridge actually fall down? I went online to find out if there are any comments on this subject. What I found surprised me. There are books published about “the darker side” of nursery rhymes. There are chat forums in which parents are talking about the words to some of these beloved rhymes I’ve mentioned, above, and they say that NOW that they realize it, it’s neglectful and ‘wrong’ to read these stories to your children. Oh dear. My son can recite many of them aloud already – I’ll be found to be a negligible mother. But I maintain they’re humorous, and that means something, right? Besides, The Real Mother Goose has been on the bestseller list for children’s books since the early 20th century. Are these parents lying about not reading these rhymes to their kids nowadays? Is it a reflection of how uptight and moralistic and overly vigilant we’ve become, especially as it pertains to our children? Do many modern parents really want to expurgate Mother Goose? I mean, the old woman does fly in a basket up to the sky to clean the cobwebs out – you know what that means – she’s likely a witch!